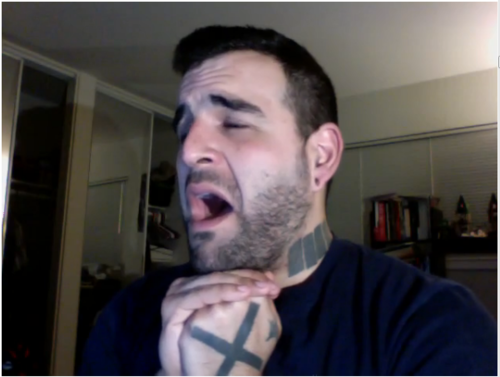 Formerly Danny_SAP, I've transitioned since I last was regularly commenting. Wooo fun times. 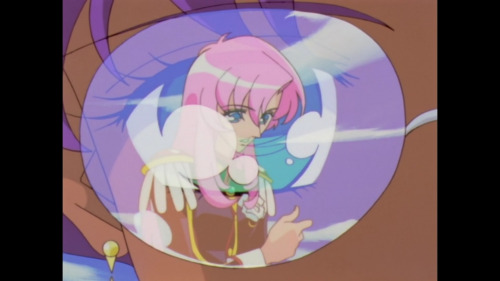 Here for Utena. Dani_SAP has not added any external profiles yet. 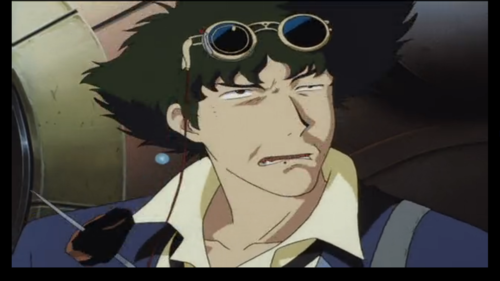 Wakabaaaaaa how do you even pretend to be straight I love you so much. 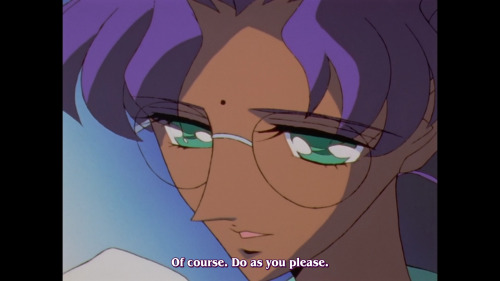 Anthy stirring her tea is perfect. 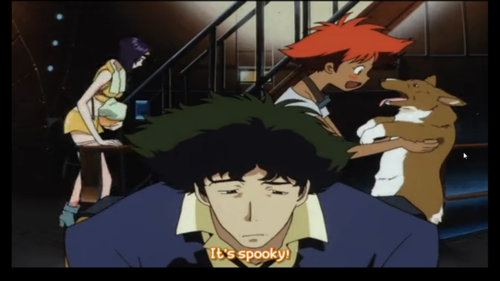 This scene just kills me. Nagul'f orra qbvat guvf fuvg sbe fb ybat naq fur unaqyrf guvf ntterffvir, juvavat obl nf vs ur'f gur puvyq ur cergraqf abg gb or. Fur pna'g svtug onpx culfvpnyyl orpnhfr bs ure... sbe ynpx bs n orggre jbeq... fgngvba va yvsr, ohg fur pna vafhyg uvz gubebhtuyl jvgu ure fhtnel qvfqnva. Naq ure oevrs ubcr gung Hgran zvtug or qvssrerag vf fb dhvpxyl qnfurq ol Hgran'f hggre qvfertneq sbe ure fvghngvba. 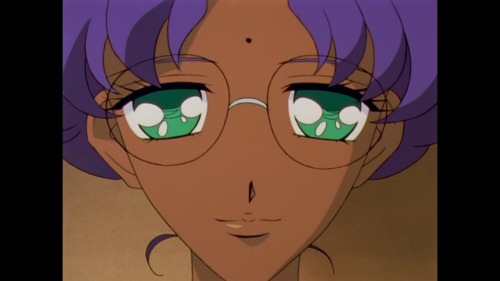 I'll have more to say about Anthy's glasses later on. For now it's just a gorgeous shot. 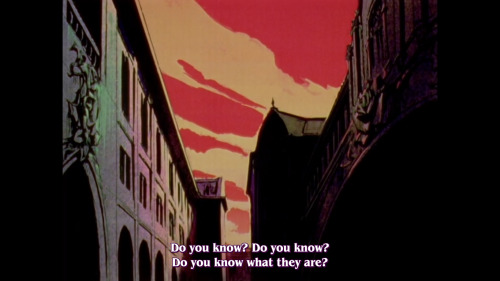 Inside the Body of the Paleozoic Era is one of my favorite duel songs. The Paleozoic Era in my flesh. Closer and closer to death. 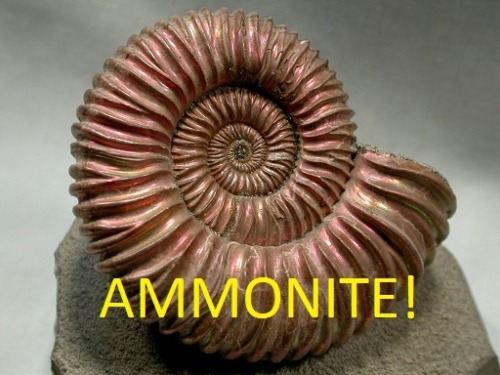 The endless story of the Paleozoic. I travel down into the depths of the sea. Down through the history in the depths of the sea. And at the bottom I find myself. 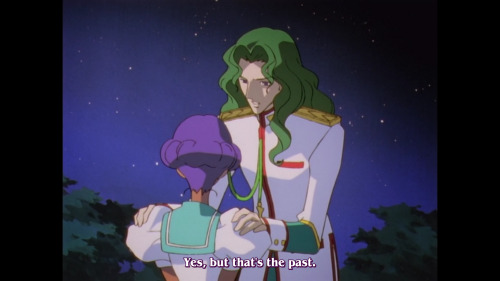 Hiiiiiiii I said I'd be back after I either recovered from the... uh... discussions from the last couple seasons of Buffy or when Mark started Utena, which ever came first. I'm thrilled. 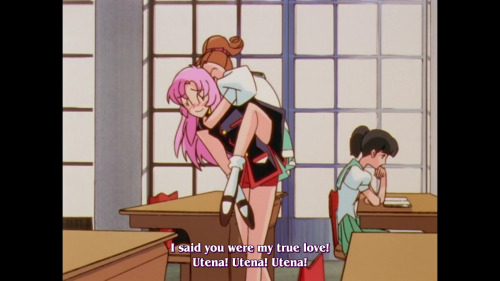 I only watched Utena for the first time earlier this year and it made an immediate impression. It is so tightly plotted, the character work is so on point, and the treatment of HORRIBLE THINGS is so well done, that I just fell in love and it immediately jumped to the top of my all-time favorites list. 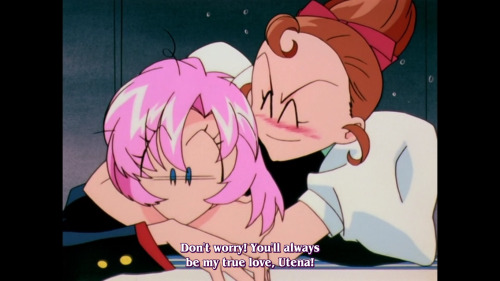 As this is a series that consistently builds upon everything that came before, let's just say that I adore Wakaba and Utena's relationship. 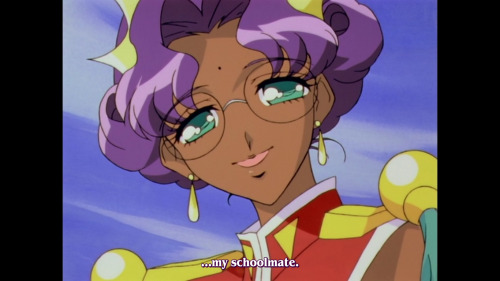 and I love Anthy more than anything. Everything is perfect, everything hurts. V jvyy nyfb or ba ernql gb fcvg sver ng gur cnegvphyneyl ercerurafvoyr frpgvbaf bs gur snaqbz fubhyq gurl qrpvqr gb fubj hc. 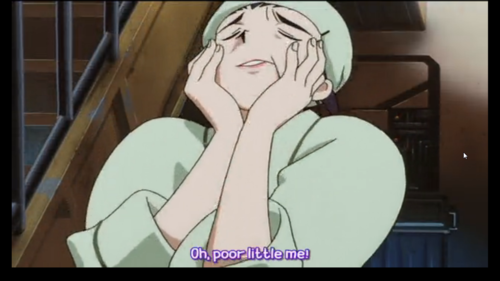 Drat! I was afraid of that. Definitely not snarking you. It's almost as if a conversation can be seen from multiple viewpoints at the same time and critique isn't a binary value judgement. You're not the only one and Sam's "hip hop hand motions" pretty much sealed my dislike. I'd like to add a couple things to monkeybutter's response: when Mississippi only just formally ratified the 13th amendment this year, I have a hard time thinking of Slavery as something "in the past." This isn't even to mention that de facto slavery persisted well into the 20th century. Lastly, African American wealth is practically nil in the USA, and this is one of the clearest ways to get a window into the long term effects of both slavery and then post-1865 structural racism. Not only were black people denied the ability to save for their children, since they made no wages, or to even raise their own children for that matter, they were systematically denied other governmental and private programs that enabled white wealth accumulation. It's hard to buy a house when nobody gives you a loan. That means there's no house to pass down the generations. No house to borrow money against and serve as a foundation for saving more money. Etc etc etc. There's a whole host of other examples for why username:Sara is wrong, but I'll leave it at that. 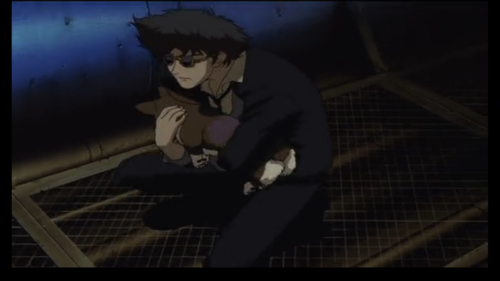 My favorite is Spike holding Ein because of feelings. Very very true. 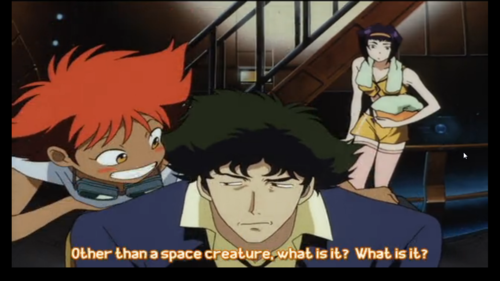 What I love about Spike is that he can be super competent and caring (important Cs) and but then he eats very disgusting things and allows lobsters to turn into deadly space goo and I'm sure is gross in 100s of other ways. 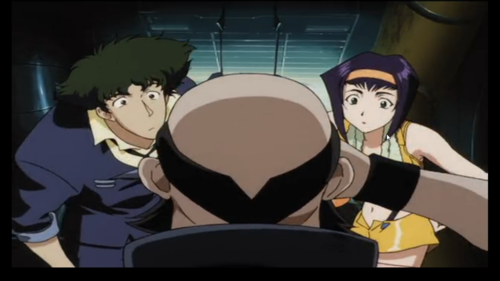 I took a lot of screencaps because this episode is great. I took surprisingly few caps of Ed, it seems.